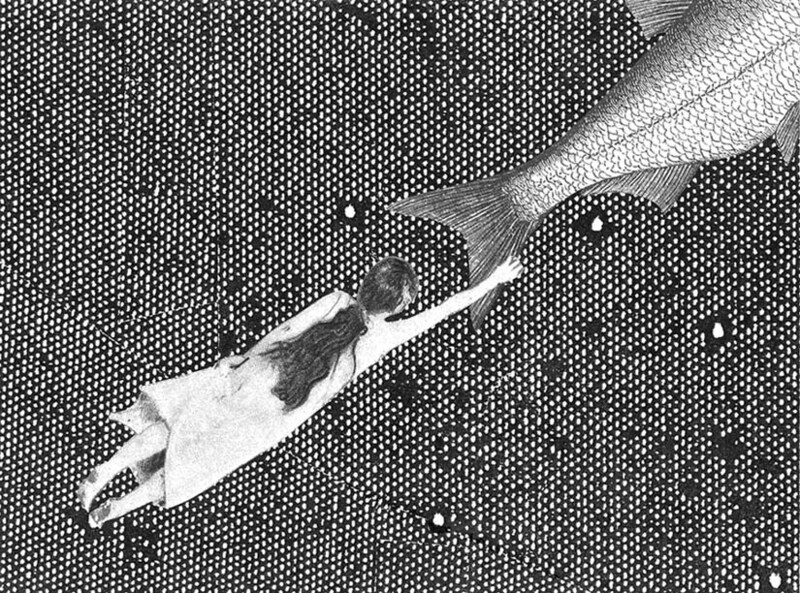 Stacey Steers, Fish Dream (2006). Mixed media on paper, 6 × 8 inches. Stacey Steers’s Fish Dream appeared on the cover of the Spring 2012 issue of Signs (volume 37, number 3), which featured a comparative perspectives symposium titled “Fish/Wives: Gender, Representation, and Agency in Coastal Communities,” edited by Valerie Burton. Fish Dream is a still from my animated film, Phantom Canyon, which was created from over four thousand handmade collages incorporating photographs from Eadweard Muybridge’s Human and Animal Location, first published in 1887. With typically eight hand-painted drawings or collages for every second of animation, my films take years to complete. Phantom Canyon is my personal recollection of a pivotal journey taken years ago. The film is a metaphorical circumnavigation of that experience, in addition to a meditation on my process of reflection, interpretation, and expression. © 2006 by Stacey Steers. Permission to reprint may be obtained only from the artist. Stacey Steers lives in Boulder, Colorado, where she teaches for the Film Studies Program at the University of Colorado. Her labor-intensive films are composed of thousands of individual, handmade works on paper. Her animations have screened at Sundance Film Festival, New Directors New Films in NYC, Telluride Film Festival, and numerous other festivals worldwide, winning national and international awards. She was the recipient of a major grant from the American Film Institute. She has been awarded residencies at Harvard University , the MacDowell Colony, and the Corporation of Yaddo.